This is the original design for the Rolling Stones album, Their Satanic Majesties Request. With the Summer of Love beginning in 1967, the psychedelia and drugs of the hippie movement resulted in experimental musical offerings from established bands. The Beatles, with their Sgt. Pepper's Lonely Hearts Club Band album, had received massive critical success. 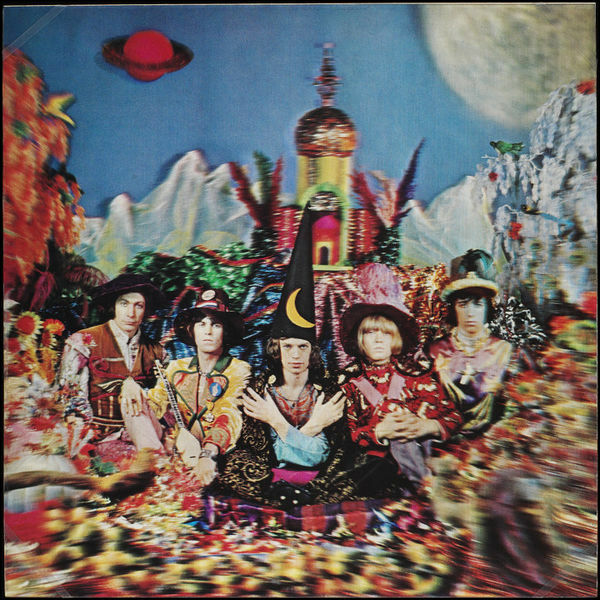 The Stones psychedelic album, following in The Beatles' wake, split opinion, with some suggesting it was sub-Sgt. Pepper, while others, particularly on reassessment later, consider it a fascinating experiment unlike any of their other albums. This artwork itself was designed by Michael Cooper, who had been asked to surpass Peter Blake's Sgt. Pepper cover photograph. The artwork still pays tribute to their associates, featuring images of the members of the Beatles in the lower corners. The big innovation was the use of transforming lenticular printing, revealing two images of the band. It was deigned to be prohibitively expensive at the size of a record cover, however, and the image was scaled down by a third and surrounded by a blue marbled border for the record cover that went on sale. Eventually it would be replaced by a simple photograph. In the 1980s the album was re-released as a limited edition with lenticular cover. The original master materials were then destroyed, intentionally, so that it never be produced again. 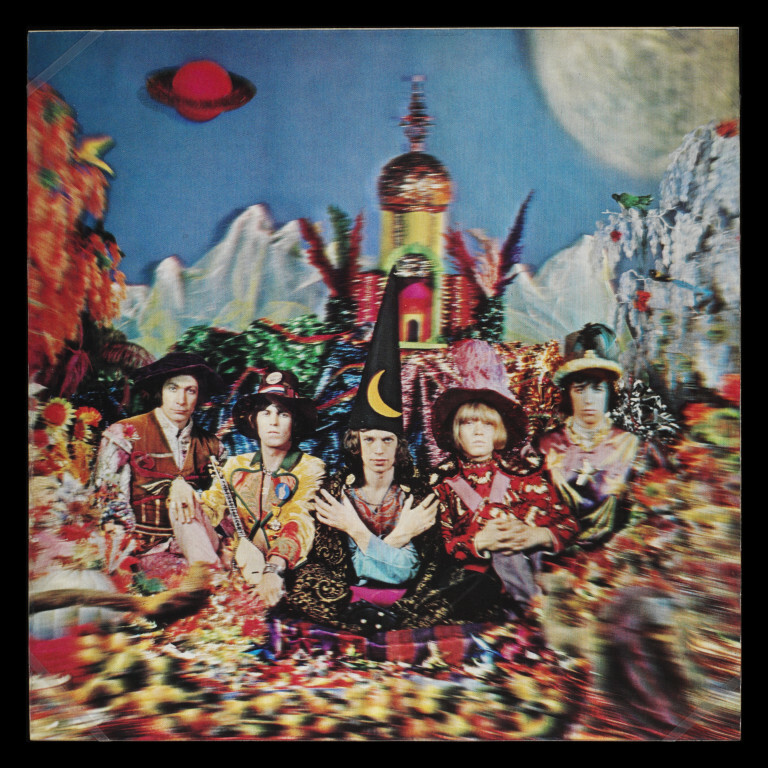 Lenticular transforming print featuring photograph of The Rolling Stones sitting cross-legged surrounded by brightly coloured scenery. Viewed from one angle, they are all looking forward with Mick Jagger, centre, crossing his arms; viewed from another, the band are looking at each other and Mick Jagger holds his arms open. Lenticular transforming print featuring The Rolling Stones. Original artwork designed for the 1967 album, 'Their Satanic Majesties Request'.